President Hamid Karzai, seen at his half-brother's funeral July 15, condemned the hanging of a boy. Kabul, Afghanistan (CNN) -- An 8 year-old boy was hanged by militants in Afghanistan's Helmand province after the boy's father -- a police officer in the southern city of Gereshk -- refused to comply with militants' demands to provide them with a police vehicle, officials said. 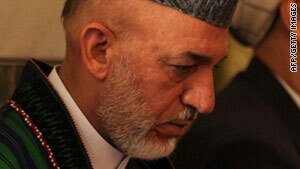 Karzai said he has ordered local authorities to root out the militants and arrest them "as soon as possible." The incident comes amid a recent wave of attacks on local officials who are considered anti-Taliban. Less than two weeks ago, Ahmed Wali Karzai, Karzai's half-brother and a provincial council chief in neighboring Kandahar, was killed in his home by a longtime bodyguard. Elsewhere on Sunday, formal ceremonies marking the handover of security to Afghan forces took place in Kabul and Panjshir province. They are the fifth and sixth areas to be transferred to national forces. Last week, the capital of Helmand province -- Lashkar Gah -- was transferred to local control as NATO begins a drawdown of troops. The area was a scene of heavy fighting and stiff resistance last year as a coalition "surge" swept southward in an effort to drive Taliban forces from their traditional heartland.